Well, technically, you can, but not in the way you probably imagine if you asked that question. 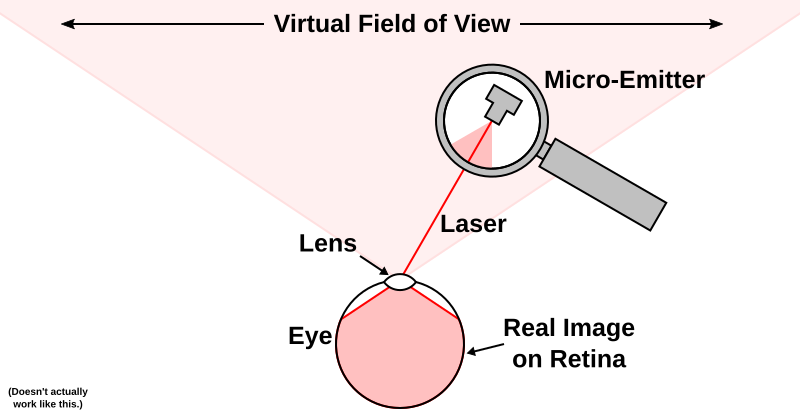 What you can’t do is mount some tiny laser emitter somewhere out of view, have it shine a laser directly into your pupil, and expect to get a virtual image covering your entire field of view (see Figure 1). Light, and your eyes, don’t work that way. Figure 1: A magical retinal display using a tiny laser emitter somewhere off to the side of each eye. This doesn’t work in reality. If a single beam of light entering the eye could be split up to illuminate large parts of the retina, real-world vision would not work.